Pioneers in the industry, we offer gasketed plate heat exchangers, copper brazed plate heat exchangers, nickel brazed plate heat exchangers, semiwelded plate heat exchangers, heat exchangers and sinned tube heat exchangers-air unit from India. Gasketed Plate Heat Exchangers Designed to allow full optimization with the chiller, the Gasketed Plate Heat Exchanger (GPHE) range includes versions to cope with pure, corrosive, foulant and hygienic fluids in combination with chiller evaporators and condensers. Plate designs prevent fouling through even flow distribution, high turbulence, and no stagnant areas. GPHE's are available in stainless steel, titanium, and high nickel alloy materials. 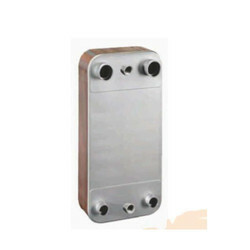 Copper Brazed Plate Heat Exchangers Available in more than 30 models, Brazed Plate Heat exchangers (BHE's) have stainless steel plates, copper brazed for high thermal efficiency and strength, Designed for refrigeration and AC duties, BHE's handle HCFC, HFC, HC and CO2 refrigerants. 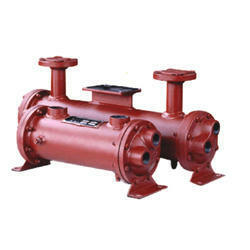 As dry expansion evaporator, they feature integrated flow distributor for maximum cooling performance. Few models are also equipped with double refrigerant circuits. Nickel Brazed Plate Heat Exchangers Available in various sizes and pressure ratings. 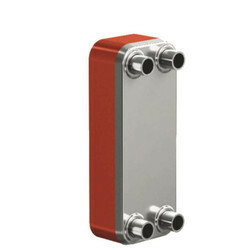 Nickel Brazed Kelvion BHE is a completely new type of plate heat exchanger, the brazed plate heat exchanger, made of stainless steel & is brazed with Nickel, Nickel brazed heat exchangers are well suited in applications which put high demand on cleanliness or applications where e.g. Ammonia or LiBr are used, or application where copper contamination is not acceptable, for high thermal efficiency and strength as well as good resistance to Pressure and thermal fatigue. 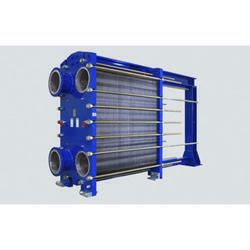 Semiwelded Plate Heat Exchangers (SWPHE) is available in many variants. The refrigerant flows in laser-welded, sealed plate channels, and the brine in Gasketed channels. The flexible design copes with fatigue stresses and ice formation. The SWPHE handles most refrigerants on the welded side and is particularly suitable for ammonia duties. Standard plate materials are stainless steels and titanium. A Heat Exchangers is a device used to transfer heat from one fluid to another while preventing the two from intermingling. The three main types are shell and tube heat exchangers, air-cooled finned tube heat exchangers and plate heat exchangers. Generally, there is a metal wall partitioned between the two fluids that acts as a conductor. A hot solution flowing on one side of the barrier transfers its heat to a cooler solution flowing on the other side. Thermal energy only flows from the hotter to the cooler in an attempt to reach equilibrium. The surface area of a heat exchanger affects its speed and efficiency; the larger a heat exchanger surface area, the faster and more efficient the heat transfer. Integrated Engineers & Contractors Make Shell & Tube Heat Exchangers remains the industry standard in ultimate value and long-term reliability. This proven fixed & floating tube sheet shell & tube heat exchanger offers the cost effectiveness that comes with having a highly standard design, while easily providing for various options to meet. Kuba's extensive, groundbreaking research and innovative testing methods have to lead to the development of tube fin system that offers the optimum combination of maximum heat transfer with minimum loss of pressure. 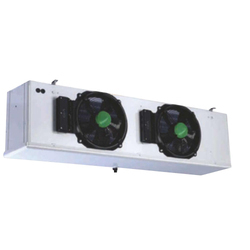 Optimized k value allows for high refrigeration capacity fan requires low energy input due to lower air resistance minimal frost build-up compact units with high capacity. 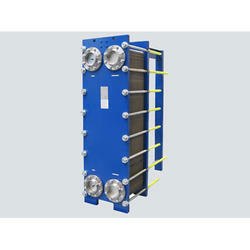 Looking for “Plate Heat Exchangers”?